This week's tip came about via a question from Bethany Fox of the Data School during our client project. 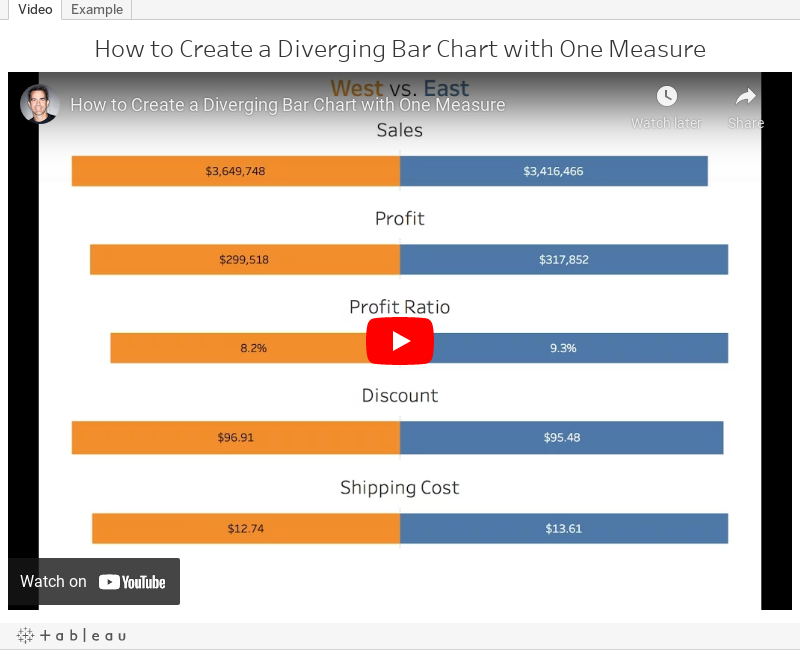 I had previously posted a tip about how to create a diverging bar chart with two measures, but she wanted to create a diverging bar chart based on only one measure. With a cheeky use of the INDEX table calculation, this was quite straightforward. In the video below, you'll see that the middle of the charts aren't lined up. I fixed this by using the INDEX calc again. You can download the workbook to see how I got it to work. I'm trying to use your tutorial as an exercise about how to make these divergent charts. So I downloaded your workbook and I have seen that you included again "Sales" in the columns, now with INDEX()=2, what centralizes the 0 point. The trick you're missing is that I made the secondary axis (INDEX()=2) a negative. This makes the axis go the opposite direction instead of overlapping. Then you format the value so that it displays as positive.